After humanity fell into sin and had their mission frustrated, God resumed his mission by calling Abram and promising to bless all the nations of the earth through him. As the book of Genesis closes and the book of Exodus opens up, we see God beginning to fulfill this promise and organizing his mission through Abram’s descendents, the nation of Israel, who have relocated to Egypt because of famine. Here we have a description of Gen 1:28 (“Be fruitful and multiply, fill the earth…”) being fulfilled among God’s covenant people. This initial fulfillment of the creation mission is what then led to the Egyptian slavery of Israel. The new king of Egypt says: “Come, let us deal shrewdly with them lest they multiply and, if war breaks out, will join our enemies, fight against us and leave the country” (Exod 1:10). The Egyptians want to stifle God’s people in their fulfillment of the creation mission. However, the more Egypt oppressed Israel, the more they multiplied. As v. 12 says, “But the more they were oppressed, the more they multiplied and spread; so the Egyptians came to dread the Israelites.” The Egyptian oppression ends up having the opposite effect–rather than curtailing Israel’s growth, their oppression serves to catalyze it. God’s covenant with the patriarchs was to give them the land of Canaan and multiply their offspring like the stars in the sky (Gen 15), and through them to bless all the nations (Gen 22:18; 26:4; 28:14). As we’ve seen, this covenantal promise is a reassertion of the creation mission. In being a “kingdom of priests,” Israel was to serve as a mediating body between God and the nations. The reason for their priestly service is what is underlined above: all the earth belongs to God, and therefore he has called Israel to represent him to the nations. The way that Israel was to do this is what I’ve italicized: they were to obey him. We saw the critical role that obedience played in the call of Abram, and here this role is reiterated for Israel–by obeying God as King, Israel would model to the nations what it means to live under his lordship. And again, as we noted last time, Israel’s obedience was not a matter of legalism or works righteousness but was to be an expression of their faith. The torah that God gave Israel at Sinai did not require perfection–in fact, it assumed failure (cf. Leviticus). What it required was a humble and repentant disposition that sought God’s forgiveness when failure came. Often times people mistakenly think of the commands of the Pentateuch as some sort of moralistic list of do’s and don’ts. However, when properly understood in the storyline of God’s mission, we see that the torah is really a playbook for mission. Here we see an explicit allusion to the creation mandate of Gen 1:28 that is a direct result of the people expressing their faith by obeying God’s commands. This was a primary way that Israel could serve as a kingdom of priests–show forth to the nations the greatness and wisdom of God by obeying his kingly word. Third, if Israel failed to obey, they would be destroyed and therefore not fulfill the mission. This is expressed in a variety of places, including Deut 8:19-20. In addition to Israel’s call reflecting several aspects of the creation mission, various connections also exist between their commission to conquer Canaan and the creation mission. “The LORD will surely comfort Zion and will look with compassion on all her ruins; he will make her deserts like Eden, her wastelands like the garden of the LORD” (cf. Ezek 36:35; Joel 2:3). Second, the charge for Adam to ‘subdue’ parallels Israel’s charge to ‘conquer.’ In the creation mission, Adam was to “be fruitful and multiply, fill the earth and subdue (Heb. kabash) it” (Gen 1:28). The only other way the verb kabash is used in the Pentateuch is to describe Israel’s conquest of Canaan. When speaking to the tribes who received their land allotments east of the Jordan, Moses commanded that they must cross the Jordan with the rest of Israel and help in conquering Canaan. He said, “When the land is subdued (Heb. kabash) before the LORD, you may return and be free from your obligation to the LORD and to Israel” (cf. 32:29; Josh 18:1). This explicitly connects the conquest with creation-missional activity. In short, just as Eden was the staging ground for Adam to engage in mission, so was Canaan the staging ground for Israel to do so. Both were to be subdued as part of the process of God’s people being fruitful and multiplying and filling the earth. If Israel would obey God’s word, he would give them victory in battle (e.g., Deut 28:1-2, 7), which applied especially to the conquest of Canaan. In Josh 1:6-9, the Israelite army is thrice told to “be strong and courageous” (vv. 6, 7, 9). However, the middle section (vv. 7-8) has extensive instructions on the importance of holding fast to the torah when engaging the enemy. In short, Israel’s success in “subduing” the land was contingent not upon their military tactical capability but on their faith in God as expressed through their adherence to his word. God’s people rightly engage in mission, representing him to the scattered nations of the world, not by their own ability or ingenuity, but by holding fast to his word and expressing their faith by their repentant obedience. However, as we’ll see next time, Israel failed to live with this repentant disposition and therefore did not succeed in the mission God gave to them. If you’re looki ng for a Bible study to help you engage the biblical text and challenge you for application, I encourage you to check out Crossway’s new Knowing the Bible series. 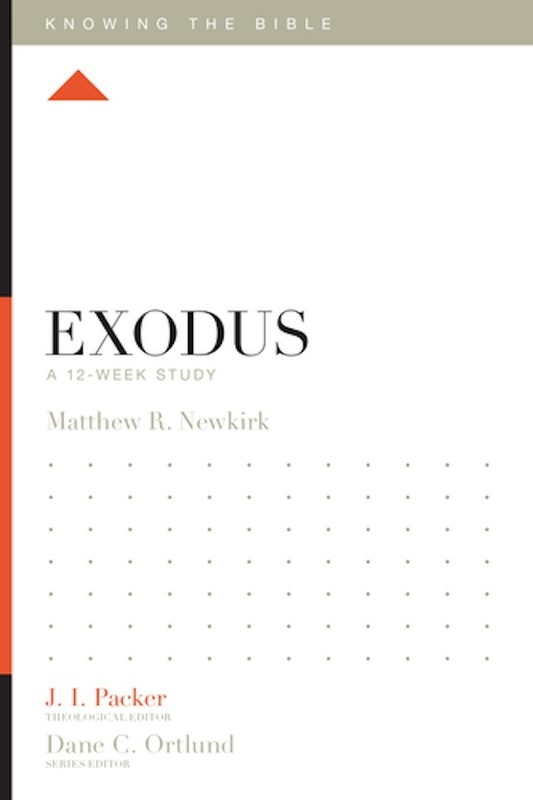 Several volumes have already been released, and several more are scheduled to be published next June (including the Exodus volume by your truly!). These studies provide both inductive questions and instructive teaching to help you understand the text better, and can be used in both individual and small group settings. And at only $8.99 a volume, they won’t drain your wallet either! How should we engage in theological debate? When I was fresh out of college, I developed a rapid desire to know the Bible and theology better. I began to read books, listen to lectures, study Greek on my own, and enter into conversations on theological message boards. However, while my knowledge of the Bible and understanding of theological doctrines grew substantially, my wisdom in debating these things did not. As I engaged people of differing views, my posture tended to be overly confident of my own position and quickly dismissive of others’ positions, and my rhetoric often included a not-so-subtle undercurrent of attempting to make others look and feel stupid for believing what they did. Had they even read the Bible, let alone studied it carefully? Did they really take God’s word seriously? They must not, because if they did, they would certainly agree with me. Since that time I have been graced with the opportunity to complete both a master’s and a doctoral degree in biblical studies, and standing here at this point in my theological journey I now see that my behavior at the beginning was both foolish and arrogant. I’ve also observed that my aggressive proclivities as a young armchair theologian are not unique to me, but in fact plague theological debate, especially as it occurs on the internet. And while I am all for believers seeking to “teach what is in accord with sound doctrine” (Titus 2:1), I’m convinced that several priorities are often neglected when Christians debate theology. The first Christian priority that often exits the stage of theological discussion is love. 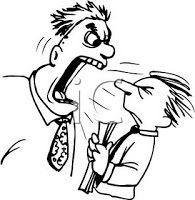 The usual comeback from overly-zealous theologizers against the charge that they are being unloving is that “love” should not be confused with “niceness.” After all, Jesus turned over tables in the temple and Paul did not always pen niceties when chastising others for theological error (e.g., Gal 5:12!). The problem with appealing to these events, however, is that while these are examples of divine and apostolic “tough love,” this is not the way Scripture instructs us to respond to error. “If I have the gift of prophecy and can fathom all mysteries and all knowledge, and if I have a faith that can move mountains, but have not love, I am nothing” (1 Cor 13:2). The second priority that is often lacking in theological debate is humility. Having traveled the path from being an uneducated armchair theologian to being an ordained doctor of the church, I’ve found it most interesting that overconfidence and arrogance seem to be much more prevalent at the lower levels of theological discourse. That is, you’ll encounter much more rigid dogmatism on blogs and message boards than you will in doctoral seminars or at the Evangelical Theological Society. One of the reasons for this is that, as you persist in formal biblical study, you are exposed more and more to the vast array of theological positions (held by people who are not stupid!) and plausible interpretations of various texts. This makes you more cautious about dismissing someone else’s view too quickly and instills a healthy amount of humility concerning your own position. This is not to say that there is isn’t one correct position or one correct interpretation of any given text. This isn’t even to say that you can’t be confident in your own understanding of Scripture. But this exposure does force you to evaluate other views very carefully and express yourself judiciously. For many who debate theology aggressively, each doctrine is often held just as staunchly as the next. This can result in them claiming that virtually every differing view is an attack on the gospel itself, whether it pertains to the deity of Christ, positions on the sacraments, or interpretations of the millennium. On this approach, beliefs are either totally embraced or totally rejected in a fairly binary fashion. And yet it should be obvious that Scripture is not equally clear on all matters. 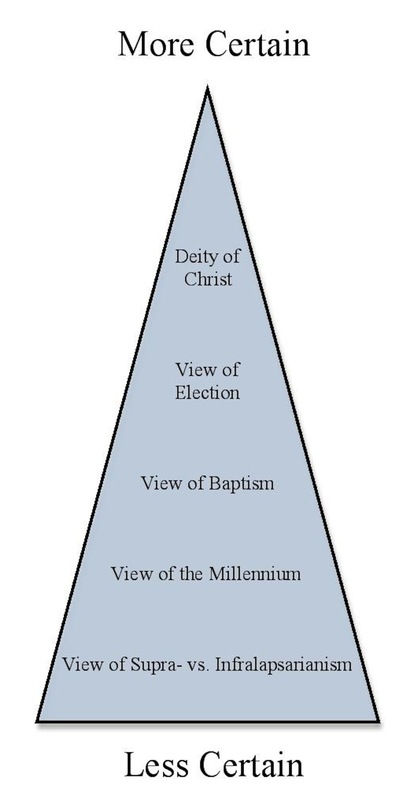 Therefore, as this diagram illustrates, our certainty concerning any theological doctrine should fall somewhere along a cone-shaped continuum. Certain beliefs will fall at the top of the cone, where our certainty is greater, while others will fall toward the middle or bottom, where our certainty is less. Also, as the cone shape suggests, we should have fewer beliefs up in the top of the cone compared to the bottom. This means that, relatively speaking, there are fewer concepts that we tether “to the heart of the gospel” and over which we divide with others, and more concepts that we hold to more “humbly.” So while we may argue vigorously for the deity of Christ, holding equally tightly to supralapsarianism over infralapsarianism is probably not warranted (and if you don’t know what those are, don’t worry!). Wisdom lies in one’s discernment of where along this spectrum any given doctrine falls and then interacting with others over that issue with correspondent humility. “My prayer is not for them alone [i.e., the disciples]. I pray also for those who will believe in me through their message, that all of them may be one, Father, just as you are in me and am in you. May they also be in us so that the world may believe that you have sent me” (John 17:20-21). Here Jesus prays that His followers would be united together along with Him and the Father so that the world believes that the Father sent Jesus into the world. That is, the unity of the church is to be a testimony to the world of the incarnation and ministry of Jesus himself. This implies that such unity is visible to the world and not simply the de facto unity that exists among true believers through the Spirit. In response, aggressive theologizers will often say, “There is no unity unless we’re united in the truth!” While this is true to a certain extent, what lies behind this statement is an insufficient understanding of intellectual humility as discussed above. Unity must revolve around truth, to be sure, but the real question is, “Which truths are necessary to unite Christians?” Doctrines like Jesus’ deity, man’s need of forgiveness, salvation by grace through faith, etc. are obviously necessary elements for true Christian unity. Other theological items further down our cone of certainty may or may not be necessary for true unity to exist. But because Jesus prays for the visible unity of the church, we are obliged to prioritize the pursuit of unity as we debate theology. I don’t pretend to have mastered any of these above stated priorities. However, at 35 years of age I do believe I have a firmer grasp of my own intellectual finitude than I had when I was 25. While we may disagree with each other over various theological topics, we are called to do so while lovingly and humbly pursuing a unity that the world can see, which will testify that Jesus has indeed come into this world. After humanity’s mission is frustrated because of sin throughout Gen 3-11, culminating in their rejection of the creation mandate at the Tower of Babel, God confuses their language and disperses them across the face of the earth, thereby creating the nations. God then resumes His mission by calling one man–Abram–and promising to bless the scattered nations of the world through him. In these verses we see several important things. First, this call is structured around two imperatives: “Go” and “be a blessing.” Logically, the second imperative is contingent upon the first. That is, in order for Abram to “be a blessing,” he must first “go.” This is why the ESV renders the last part of v. 2 as a result clause: “so that you will be a blessing.” And interestingly, these two imperatives can be viewed as the inverse of the decline of humanity in Gen 4-11 that we saw last time. To “go” is the opposite of centralizing, and to “be a blessing” (with its connotations of fruitfulness and vitality) is the opposite of murder. Second, we see a narrowing and a broadening throughout these verses. That which Abram must give up by going is increasingly narrowed (“country” = nation, “kindred” = extended family, “father’s house” = immediate family), while the recipients of the blessing that results from his going increasingly broaden (Abram himself [“I will bless you”], those who bless Abram [“I will bless those who bless you”], and finally “all the families of the earth shall be blessed”). Third, this call of Abram contrasts with the Babel account. In ch. 11, the “whole earth” is in focus as humanity rebels against God (vv. 1, 4, 8, 9 [2x]), which contrasts with the worldwide focus of Abram’s call to bless “all the families of the earth (12:3). While the Babel builders are concerned to “make a name for themselves” and refuse to go to the ends of the earth (11:4), God tells Abram that if he will “go,” He will “make his name great” (12:2). And lastly, God’s call of Abram is portrayed as His gracious response to the sin and rebellion of Babel. There is a repeated pattern in the Primeval History of sin-judgment-grace. Adam & Eve sin by eating the fruit. God judges them by casting them out of the Garden. Grace is shown by promising a Redeemer who will crush the serpent’s head (3:15). Cain sins by murdering Abel. God judges him by sentencing him to wander the earth. Grace is shown by the mark placed on Cain to protect him from blood vengeance. In Noah’s time the whole earth is full of the sin of violence. God judges them by sending the flood. Grace is shown as Noah and his family are saved in the ark (6:8). The Babel builders sin by centralizing rather than spreading. God judges them by confusing and dispersing them. Grace is shown as God calls Abram and promises to bless the nations through him. Fourth, it’s important to see that Abram obeyed God’s call (v. 4). Discussions of Abram’s call often conclude at v. 3, but as the next section will show, Abram’s obedient response is critical for God’s promise to bless the nations. Repetitions of the promise to Abram emphasize his obedience. In the following three repetitions of the Abrahamic promise (that “all nations on earth will be blessed through him”), emphasis is placed on Abram’s obedience as the reason the nations will be blessed. However, human effort is not the ultimate cause of God’s mission succeeding. We know from Paul that it was Abram’s faith that was the operative element in these passages. “The Scripture foresaw that God would justify the Gentiles by faith, and announced the gospel in advance to Abraham: ‘All nations will be blessed through you.’ So those who have faith are blessed along with Abraham, the man of faith” (Gal 3:8-9). “You foolish man, do you want evidence that faith without deeds is useless? Was not our ancestor Abraham considered righteous for what he did when he offered his son Isaac on the altar? You see that his faith and his actions were working together, and his faith was made complete by what he did” (Jas 2:20-22). Here James recalls the near-sacrifice of Isaac (Gen 22), which is one of the places we looked at above that reiterates God’s promise of blessing to the nations. So while we should never rely on our obedience for salvation, we must recognize that God chooses to work through our obedience in accomplishing His redemptive mission in the world. Other passages in the patriarchal narratives show that this covenantal calling of Abram and his offspring to bless the nations is a reassertion of the creation mission (“Be fruitful and multiply”). Gen 26:4-5: The Lord speaking to Isaac: “I will cause your seed to multiply like the stars in the sky and will give them all these lands, and through your offspring all nations on earth will be blessed, because Abraham obeyed me and kept my requirements, my commands, my decrees and my laws. Notice in these various examples that now, instead of being phrased as an imperative (“Be fruitful and multiply”), it is said that God will make them fruitful and cause them to multiply. That is, God will actively enable His chosen people to carry out the creation mission. Their responsibility, modeled by Abram, was to have faith in God’s word and reflect such faith by their obedience. God is going to bless Abram’s line and make them fruitful and multiply them so that they can extend His blessing to the nations. By bringing blessing and knowledge of God to the nations scattered over the earth, Abram’s descendents would “fill the earth” with redeemed and restored images of God. 1 This discourse structure is adapted from Wright, The Mission of God, 200, and my following discussion leans heavily on Wright’s insights found on pp. 201-208. The Third Commandment: “Taking” God’s Name in Vain? 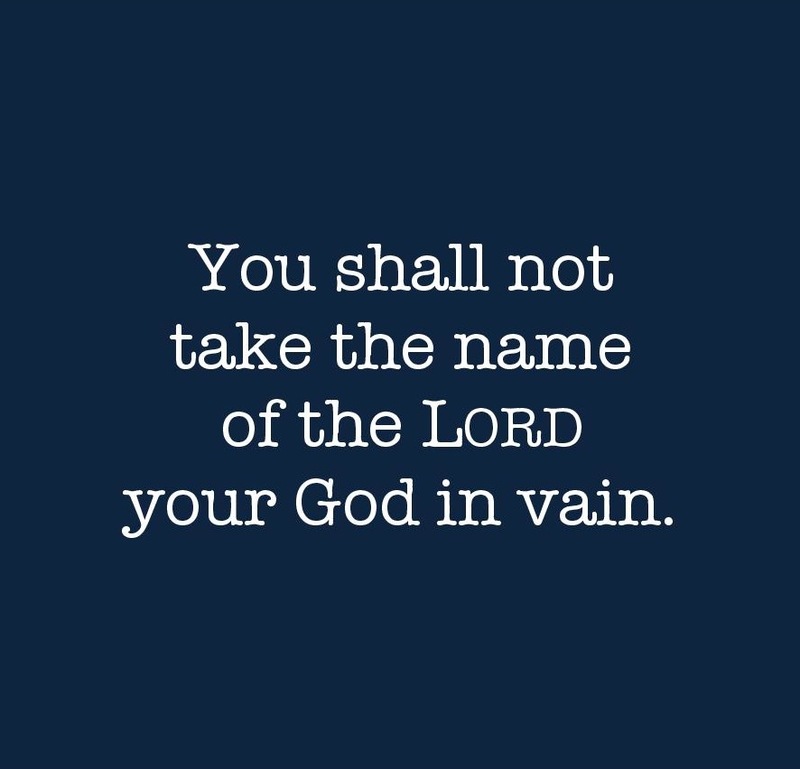 “You shall not take the name of the LORD your God in vain, for the LORD will not hold him guiltless who takes his name in vain” (Exod 20:7). Most people view this command as prohibiting one from speaking God’s name in a flippant or disrespectful manner. Taken as such, applications of this command in sermons and blog posts usually exhort people not to curse, particularly by saying things such as “God D***,” “OMG,” “JC,” and so on. God’s name is holy, and therefore we shouldn’t speak it in a frivolous way. This is true enough, but is this what this commandment is really talking about? Is This Talking About Improper Speech? It is an interesting phenomenon that this command has become so widely understood as pertaining to improper speech when the verb used is not a verb that describes speech. The verb translated above as “take” is nasa in Hebrew and means “take” in the sense of “lift, carry, or bear.” It does not mean “speak,” “say,” “pronounce,” or any other speech-oriented action. This then raises a further question: What does it mean to bear the name of the LORD? Clarity comes to this question when we look at the only other occurrence in the Pentateuch of someone “bearing” (nasa) someone else’s “name.” We find this in the instructions for the priestly garments in Exodus 28. The two stones of v. 12 each had six of the names of the twelve tribes written on them (vv. 9-10), and the breastpiece of v. 29 had twelve stones which also had the twelve names on them (v. 21). By wearing these garments and “bearing the names” of the twelve tribes, Aaron served as their representative when he entered the holy place on their behalf. This idea of “bearing the name of the LORD” is present several other places in the Bible. For example, after giving Moses the instructions for how Aaron was to bless the people (well known as the “Aaronic blessing/benediction” [Num 6:24-26]), God said, “So shall they put my name upon the people of Israel, and I will bless them” (v. 27). In short, God’s people “bear His name” in that they represent Him as His people. According to the third command, the way that we are not to bear God’s name is “in vain.” The word translated “vain” here can mean “futile, false, purposeless, or empty.” Understood this way, the force of the command is clear: we are not to “bear God’s name” (i.e. serve as His representatives) in a way that is false or empty. Basically, by our actions people are not to get the wrong idea about our God. On the one hand, if we advertise ourselves as Christians (ones who bear the name of Christ! ), yet act in ways that Jesus would not approve of, others will see us and draw inaccurate conclusions about the God we claim to serve. We are representing God falsely to the watching world. On the other hand, if we are Christians but don’t represent God at all to others (i.e., we hide our light under a bushel), it could be said that we are bearing God’s name emptily (i.e., we are representing Him to no purpose). However, the semantic range of “vain” in the third command not only prohibits us from representing God falsely but also from not representing Him at all. From this short analysis it is evident that the third commandment is not simply prohibiting people from cursing or using God’s name flippantly. It seems reasonable to conclude that refraining from using God’s name in this way is one small application of this command, since it is hardly representing God well to use His name as an expletive. However, the implications of “not bearing the LORD’s name vainly” extend far beyond improper speech. They pertain both to our overall behavior (i.e., by our words and actions we are not to misrepresent God to others) and to our propensity toward an apathetic, inward-focused faith (i.e., by our words and actions we are to be representing God to others). ** For a stimulating analysis of this command I highly recommend the essay, “Bearing the Name of the LORD with Honor,” by my doctoral supervisor, Daniel Block, found in his book, How I Love Your Torah, O LORD! It will be evident that the discussion above is greatly indebted to his work. One of Block’s other doctoral students, Carmen Imes, is currently working on a dissertation examining this meaning of the command. If you’d rather watch a video lecture than read, I’d recommend this lecture on the third command provided by the Ivy League ministry Christian Union. God’s mission in the world is for His kingship to be represented to the ends of earth. In this second segment, we will see how humanity rejected God’s kingship and how the aftermath of that rejection resulted in a frustration of our ability to engage in mission. In the Garden, God gave humanity both grace and responsibility. After God created humanity, Gen 2:15 says, “The Lord God took the man and put him in the garden of Eden to work it and keep it.” Elsewhere in the Pentateuch, the language of “working” and “keeping” is used together only to describe the priests and Levites “working” and “keeping” the tabernacle (Num 3:7-8; 8:26; 18:7). This indicates that Adam was given the privileged responsibility of serving as a priest, one who works in the special presence of God. Gen 2:16 then follows, “And the Lord God commanded the man, saying, ‘You may surely eat of every tree of the garden. '” This is the first time the verb “command” is used in Scripture, and as we see here, it is a very gracious command: “Freely eat!” God’s grace always precedes His law. The exception is then stated in v. 17: “but of the tree of the knowledge of good and evil you shall not eat, for in the day that you eat of it you shall surely die.” Just as creation obeyed God’s kingly word (“And God said, ‘Let there be light,’ and there was light” [Gen 1:3]), so must humanity, the pinnacle of creation, obey His kingly word. So in creation we see God’s extending great privilege and grace to humanity, yet also holding them responsible to submit to His authority as the sovereign King, demonstrated by their obedience to His word. In the Fall, humanity rejected God’s grace and responsibility. When we look at Satan’s and Eve’s conversation, we see that Satan directly contradicts God’s word and that Eve doesn’t know God’s word well. As this table shows, Satan’s word directly contradicted God’s word (Gen 3:1, 4), and Eve made God more restrictive than He was (Gen 3:3). By subsequently acting on Satan’s word rather than obeying God (Gen 3:6), humanity rejected God as King, along with the grace and responsibility He had extended, and instead treated Satan as king. In creation, God had commissioned humanity to “be fruitful and multiply” (Gen 1:28). Here in 3:16 is the next occurrence of the verb “multiply,” only now God is multiplying the woman’s pain in being fruitful! This is a direct frustration of the creation mission. “And to Adam he said, ‘Because you have listened to the voice of your wife and have eaten of the tree of which I commanded you, “You shall not eat of it,” cursed is the ground because of you; in pain you shall eat of it all the days of your life; thorns and thistles it shall bring forth for you; and you shall eat the plants of the field'” (Gen 3:17-18). Whereas God had previously given the gracious command to “freely eat” (Gen 2:16), now humanity will survive only through pain and toil. What all of this shows us is that our fallen state involves not simply our separation from God but also a crippling of our ability to engage in mission. This sets the stage for redemption to include not simply our reconciliation with God but also our restoration for mission. The post-fall world was characterized by murder, which is the opposite of the creation mission. That is, instead of the multiplication of God’s image, murder is the reduction of God’s image. We see this problem of murder and violence escalate as we move throughout the various narratives of Gen 4-9. In the first post-fall narrative, Cain kills his brother Abel (Gen 4:1-16). Next we read of a man named Lamech who killed a person and boasted to his wives about it. “23 Lamech said to his wives: ‘Adah and Zillah, hear my voice; you wives of Lamech, listen to what I say: I have killed a man for wounding me, a young man for striking me. 24 If Cain’s revenge is sevenfold, then Lamech’s is seventy-sevenfold'” (Gen 4:23-24). The word I’ve underlined here–“man”–is the normal Hebrew word for a man. However, the italicized word–“young man”–actually means “child” (Heb. yeled). Significantly, the verb from the same root (Heb. yalad) means “to give birth” and was used in God’s curse of the woman, “in pain you shall bring forth children (yalad)” (Gen 3:16). So not only is Lamech’s murder an escalation from the account of Cain and Abel (which Lamech says in v. 24), but it also alludes to the curse on the woman and shows that this act is the opposite of the creation mission. “1 When men began to multiply on the earth… (sons of God marry the daughters of men)… 5 The Lord saw that the wickedness of man was great [lit. “multiplied”] in the earth, and that every intention of the thoughts of his heart was only evil continually” (Gen 6:1, 5). “Now the earth was corrupt in God’s sight, and the earth was filled with violence” (Gen 6:11). “And God said to Noah, “I have determined to make an end of all flesh, for the earth is filled with violence through them” (Gen 6:13). After the original mandate in 1:28, these verses are the next descriptions of the “earth” being “filled.” However, rather than being filled with God’s faithful images representing His kingship, the earth is filled with violence, the opposite of the creation mission. And it’s clear that murder as the reduction of God’s image in rebellion against God’s creation mandate is the heart of the issue here because of what God tells Noah and his sons after the flood. “6 Whoever sheds the blood of man, by man shall his blood be shed, for as the image of God did He make man. 7 But you, be fruitful and multiply, increase greatly on the earth and multiply on it” (Gen 9:6-7). Capital punishment is prescribed here because humans are God’s image. In contrast to this, Noah and his sons were to re-engage in the original creation mission (v. 7). This shows us that the mission of God in the world has not changed even after sin entered the world. The post-fall world was characterized by centralization, which is the opposite of the creation mission. We see this rejection of God’s mission in the account of the tower of Babel. “Now the whole earth had one language and the same words. And as people migrated from the east, they found a plain in the land of Shinar and settled there” (Gen 11:1-2). By “settling there” and centralizing in one place, humanity was not “filling the earth” as God commanded both Adam (1:28) and Noah (9:1, 7). As the account progresses we see why humanity was doing this. “Then they said, ‘Come, let us build ourselves a city and a tower with its top in the heavens, and let us make a name for ourselves, lest we be dispersed over the face of the whole earth'” (Gen 11:4). Rather than filling the earth and thereby extending God’s kingly glory, they wanted to centralize and “make a name for themselves.” The way they attempt to do this is through their tower. In ancient Mesopotamia, a tower “with its top in the heavens” was a standard way of referring to a ziggurat,* which was a pyramid-looking structure with a large staircase, at the top of which was a shrine for the city’s patron deity. It is important to note that the ziggurat was not for the people to ascend to the deity but for the deity to descend from heaven to earth. So, despite popular understandings of this story, the people building the tower of Babel were not trying to get to heaven by their own efforts. Rather, they were trying to localize God to the place they had chosen. Rather than spreading across the earth for His name, they were centralizing for their own name. They essentially wanted to be known as those who created the place where God came to earth (significantly, “Babel” means “gate of God”). “‘Come, let us go down and there confuse their language, so that they may not understand one another’s speech.’ So the Lord dispersed them from there over the face of all the earth, and they left off building the city” (Gen 11:7-8). Here God (1) confused their language, thereby creating the “nations,” and (2) scattered them over the face of the earth. It is this climactic rebellion against God’s creation mission that gave rise to the nations of the earth. As we begin to discuss the issue of “going to the nations” in subsequent lessons, we need to remember that the reason going to the nations is important is not because God likes diversity, but because the nations have been scattered across the fullness of the earth. Therefore, reaching the nations with “the gospel of the kingdom” (Matt 4:23) is the avenue by which God’s people are to fill the earth. This means that missions has a specifically geographic concern. This implies that the church needs to be strategic geographically when considering the missionary endeavor. We need to view the goal of international missions as filling the earth, not simply going somewhere else indiscriminately. In the next segment we’ll see how God responds to the confused situation in the wake of the Babel debacle by calling Abram and promising to the bless the nations through him. * For a helpful discussion of the ziggurat and the Mesopotamian background to the tower of Babel account, see John Walton’s Ancient Near Eastern Thought and the Old Testament, 119-123. Check out this post over at The Gospel Coalition, Signs of Spiritual Awakening in Japan, written by CBI founder Michael Oh and director Brett Rayl. May the Spirit so move! Last week Lydia began preschool. For several years before we had children, Caroline was a teacher, so she has attended plenty of “Meet the Teacher Nights.” But this most recent one was her first time attending as a parent. Afterward she said to me, “This really makes me feel grown up.” And I know what she means. Lydia recently turned 4, and I’ve realized that I have vivid memories of my own life from when I was her age. I remember going to preschool. I remember running in a cornfield and getting stung by a bee. I remember Christmas that year, learning to ride a bike, and our family buying a dog that we would own for the next 17 years. But what really blows my mind is that it doesn’t feel like that long ago that these things happened to me. Yet it has been over 3 decades. And when talking to folks who are older than I am, I’m told that the time just keeps moving faster. 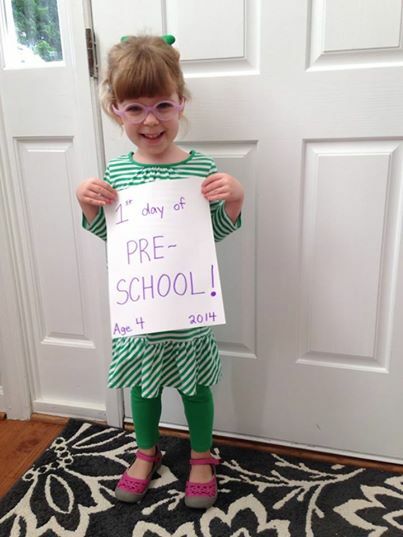 I have a feeling that before I know it, I’ll be sharing pictures of my grandkids heading off to preschool! 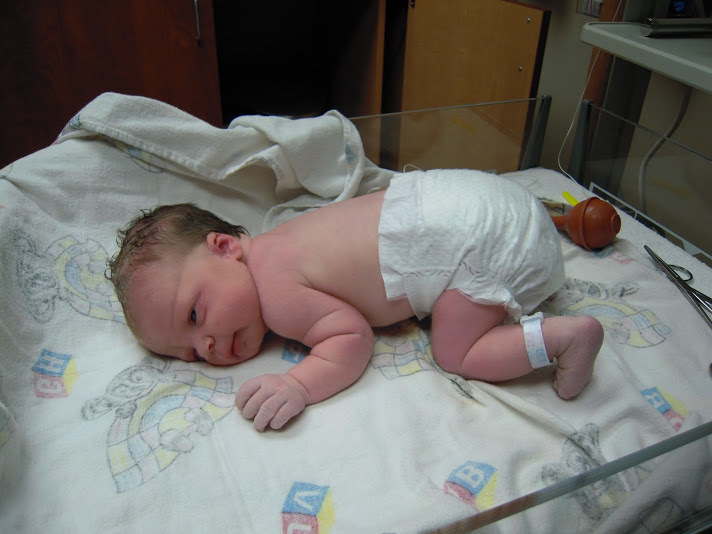 To the right is a picture of Lydia as a newborn. It feels just like yesterday that we were in the hospital with her, excited if not just a tad freaked out about being new parents. But this was 4 years ago. What all this reminds me of is how short life is and how little time we have on this earth to live sacrificially and boldly for Jesus and others. I find that in life I have a strong proclivity to overvalue things that make me look good and neglect things that make God look good. But one thing I do know: when I reach old age, if the Lord grants me the years, I want to look back and know that I did what I could to resist that tendency and seek to serve Him with all of my ability. Life is short. The time flies. When you envision yourself looking back at your own life in old age, what do you hope to see? Whatever that is, now is the time to start doing it! 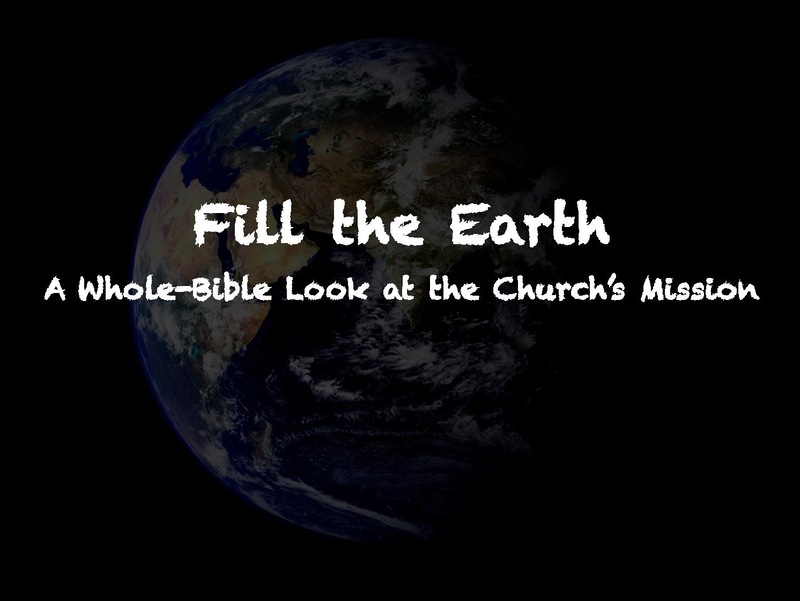 I’m teaching an adult Sunday School class at our church here in Raleigh entitled, “Fill the Earth: A Whole-Bible Look at the Church’s Mission.” We had the first class yesterday, which laid the groundwork and introduced God’s mission in the world. Here on the blog I’ll attempt to summarize the main points of the class each week, providing a distilled version of the course. The first thing we need to do is distinguish between two terms: mission and missions. Christopher Wright defines “mission” as “a long-term purpose or goal that is to be achieved through proximate objectives and planned actions” (Mission of God, 23). The question we’re asking in this class is, “What is God’s mission for this world?” Once we understand what God’s mission is, we can understand derivatively what the church’s mission is. God’s mission in the world is for His kingship to be represented to the ends of the earth. Hopefully we can see from this how “missions” relates to “mission.” We go to all the nations of the earth (“missions”) so that they will repent and submit to God’s kingship, thereby making His kingship represented to the ends of the earth (“mission”). The most common text used to promote a theology of mission(s) is the Great Commission of Matt 28:18-20 (see, e.g., Kevin DeYoung and Greg Gilbert’s What is the Mission of the Church?). Although this passage obviously relates centrally to the idea of missions, I’d like to suggest we take a Christoscopic approach to this issue. That is, how did Jesus view the idea of missions as it relates to the Scriptures. According to this text, coming to “understand the Scriptures” (which in this context means the OT) involves realizing that they concern repentance and forgiveness being proclaimed to all nations. In short, according to Jesus, the OT has a missional message (see also Acts 26:20-23 where Paul states the same). This means that to understand God’s mission and our role in missions, we need to begin not with the first book of the NT but with the first book of the OT. We need to pursue a whole-Bible theology of mission. When we open up the OT, we see on the first page how God mandates His mission to humanity. I’ll summarize this under two points. First, in the creation account, God is depicted as a King. We see this in a variety of ways, from God issuing commands that are immediately heeded (“And God said, ‘Let there be light,’ and there was light” [Gen 1:3]) to Him evaluating (“God saw that the light was good” [Gen 1:4]) and naming (“God called the light ‘day,’ and the darkness he called ‘night'” [Gen 1:5]) the various elements of creation. However, the aspect of Genesis 1 revealing God as King that we’ll focus on is His creation of humanity. “Then God said, ‘Let us make man in our image, after our likeness, and let them rule over the fish of the sea and the birds of the air, over the livestock, over all the earth, and over all the creatures that move along the ground'” (Gen 1:26). Therefore, for God to make man as His image means that human beings exist to represent God’s kingly glory on the earth. That is why you and I are here. “God blessed them and said to them, ‘Be fruitful and multiply; fill the earth and subdue it'” (Gen 1:28). Since humans are God’s image, and since God’s first command to humanity is to multiply and fill the earth, it follows that God’s mission in creation is for His kingship to be represented to the ends of the earth. We’re going to see in future weeks how this command, “be fruitful and multiply,” is woven throughout virtually every portion of the Bible, alluding to this original command and providing a central thread by which to trace God’s mission as it develops throughout the pages of Scripture. * For those interested in reading up on this concept of humans as God’s image and our royal representative function, I recommend Richard Pratt’s Designed for Dignity if you’re looking for a simplified discussion (esp. pp. 1-37), and J. Richard Middleton’s The Liberating Image if you’re looking for an in-depth treatment. Since I’ve been engaged in the work of “raising support,” as it is commonly called, I thought it would be appropriate to offer a brief “theology of supporting missionaries.” The intent of this post is to encourage those of you who participate in missions through financial support, whether you do so in partnership with us or with others. Now that I’ve introduced this post this way, I want to offer a slight critique of this common nomenclature that we use: “supporting missionaries.” To start off, I understand why we describe this act in this way. Missionaries are the ones who go to the mission field, and the people who provide the funds that enable them to go are “supporting” them. It makes sense. Yet the more I’ve thought about this, the more I think this terminology is misleading. To say that the folks who stay home and sacrificially provide funds are “supporting missionaries” seems subtly to imply two things: (1) that they are not directly participating in the work of missions themselves, and (2) that the money they donate is being given to the missionary. 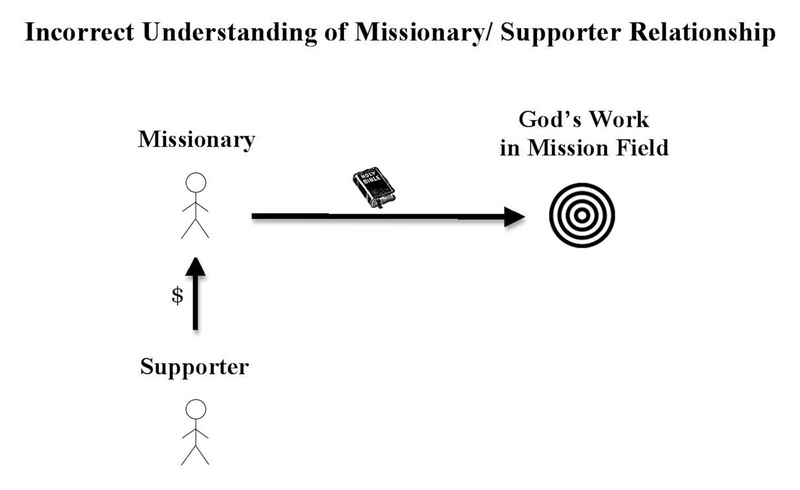 As you can see in the illustration above, on this understanding the conceptual line of giving goes straight from the supporter to the missionary, and there is no direct line from the supporter to God’s work on the mission field. It is only the missionary ministering God’s word in the foreign land who is viewed as directly involved in God’s work on that mission field. When the missionary/supporter relationship is conceived this way, missionaries can often feel self-conscious asking people to give funds because it feels like they’re asking potential supporters to give to them. This incorrect understanding can also lead to the false view that supporters are somehow second-class citizens when it comes to the missionary endeavor, since they are allegedly not directly involved in the mission work. But all of these are mistaken conclusions. “I myself have put you in charge of the offerings presented to me; all the holy offerings the Israelites give me I give to you and your sons as your portion, your perpetual share” (v. 8). That is, the people were to give offerings to the Lord, which He then redirected and designated for the temple servants as their livelihood. Repeatedly throughout the chapter God reiterates this emphasis that the gifts brought by the people were given to Him yet used for the temple servants (vv. 9, 11, 12, 13, 14, 15, 19, 21, 24, 26). “Don’t you know that those who serve in the temple get their food from the temple, and that those who serve at the altar share in what is offered on the altar? In the same way, the Lord has commanded that those who preach the gospel should receive their living from the gospel” (1 Cor 9:13-14). Based on the OT precedent, the implication here is that church members who give funds toward missions are giving offerings to the Lord. These funds are used to provide for those who preach the gospel vocationally–the NT equivalent of the priests and Levites–but conceptually they are offerings given to God himself. 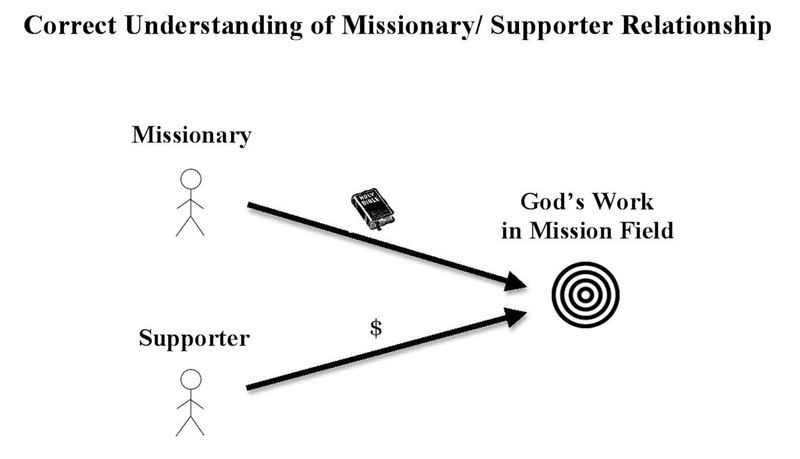 Based on this biblical model, it seems that a better way to understand the missionary/supporter relationship is that of a partnership. Viewed this way, both missionary and supporter are directly participating in God’s work on the mission field; one participates by going and the other by giving. The supporter is not giving his money to the missionary but bringing an offering to God, and therefore the conceptual line of giving here goes straight from the supporter to God’s work. Similarly, when “raising support,” the missionary need not feel awkward about asking people to give because they are not asking the potential supporter to give to them but rather presenting them with an opportunity to worship God and participate in His mission. This makes the missionary and the supporter partners in the missions endeavor. Rather than the missionary being a player in the game and the supporter being a fan cheering on the sideline, both are standing side-by-side on the playing field. They play different positions, to be sure, but they necessarily complement one another, and no points are scored without both playing their part. Neither has a higher calling, and neither is second-class. Of course, the funds offered by the supporter are functionally used to provide for the needs of the missionary, but by keeping these distinctions in mind we see that the ministry of “partnering with missionaries” is first and foremost an act of worship entailing offerings to God and therefore direct participation in what God is doing on the mission field. The Great Commission: Are We Actually Commanded to “Go”?